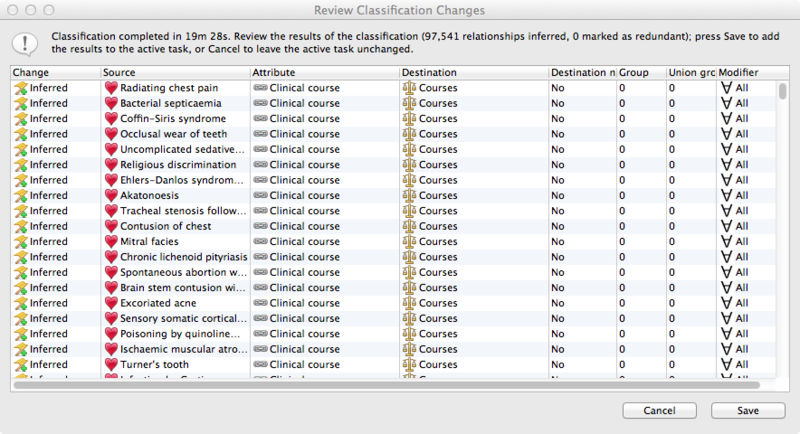 This is an example of classifying a newly added concept that does not exceed SNOMED CT's current description logic expressibility. 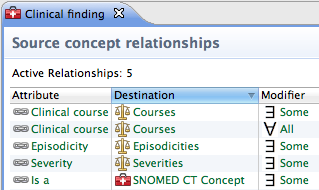 Snow Owl supports creating disjoint concepts. The disjointedness of sibling concepts can be set at the parent classes concept editor by setting the Subclass enumeration to Exhaustive on the Overview page. If you would like to make a few concepts disjoint that may not necessarily have the same parent, or the parent has other, not disjoint subclasses there is a workaround for that too. You need to create a meaningless container concept, that will only exist for the purpose of holding the disjoint classes together. Then all the concepts that you would like to make disjoint, should be attached to this container concept with an is_a relationship. The last step is to set the 'Subclass enumeration' property of this container concept to 'Exhaustive', so indicating, that all the subclasses are disjoint from each other. Create Dots with IS A relationships to both Cats and Dogs. 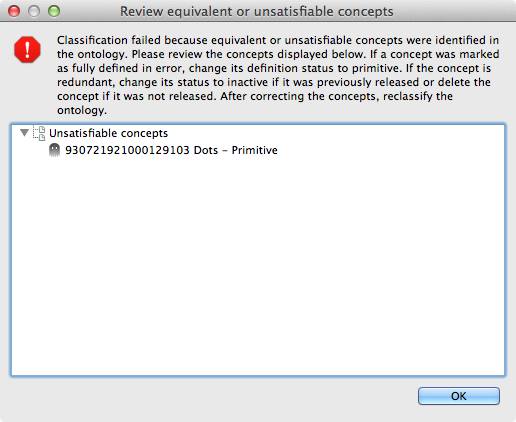 The equivalent classes dialog should show up displaying Dots under the label "Unsatisfiable concepts." Snow Owl now supports description logic negation. You can add negation to a newly created relationship by setting the Destination negated property to 'yes' on the New relationship wizard. Negating an already existing relationship is not possible, for that you need to inactivate that relationship first and create a new one with the same attribute and destination but the 'Destination negated' property set to yes. Look up Consciousness related finding (106167005) and make subclasses disjoint by setting the subclass enumeration to exhaustive. 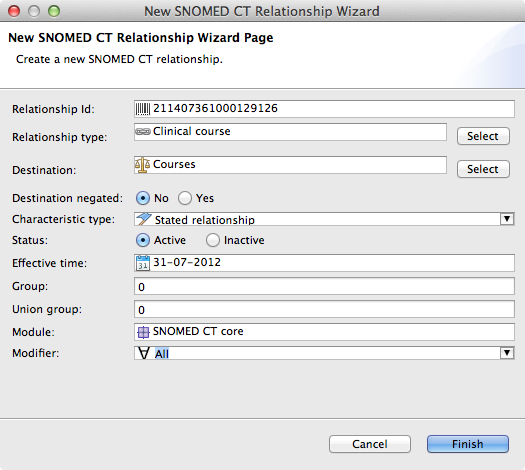 Associated finding: NOT Loss of consciousness (419045004) (you have to set the destination to negated in the new relationship wizard). This makes this concept fully defined so please set it to fully defined on the overview page. 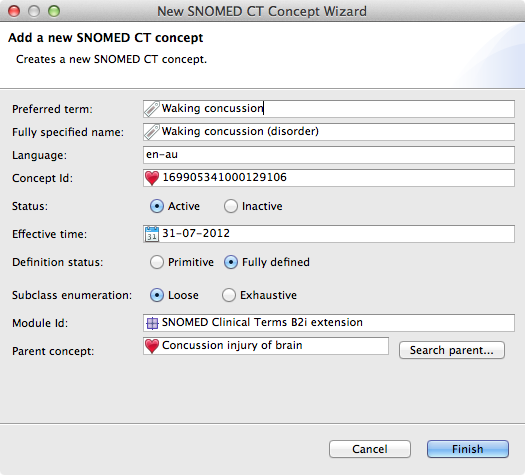 Create a new concept: Waking concussion as a child of Concussion injury of brain (110030002). Waking concussion will appear as a child of Concussion with no loss of consciousness, its IS A relationships to its original parents are marked as redundant. The other child of Concussion with no loss of consciousness (Concussion with mental confusion AND/OR disorientation without loss of consciousness) will inherit the associated finding: NOT loss of consciousness relationship. Snow Owl supports description logic disjunction. When creating an union of two clinical meanings the disjunctive concept appears as the parent of the two joined concepts. The actual union has to be reflected by the relationships too: the same union group (other, than 0) and the same relationship group should apply for those relationships that are important for the definition of the disjunction. Concepts related to fractures or strains of upper limbs should show up as the children of the newly created concept. CB will incorrectly infer that the parent class of Fracture OR strain of upper limb (last statement on the image) is Disorder of musculoskeletal system instead of its subclass Injury of musculoskeletal system. Since CB's reasoning is incomplete over non-Horn ontologies, it should not be used with ontologies requiring disjunction. Snow Owl supports the addition of numerical datatypes at certain use cases. 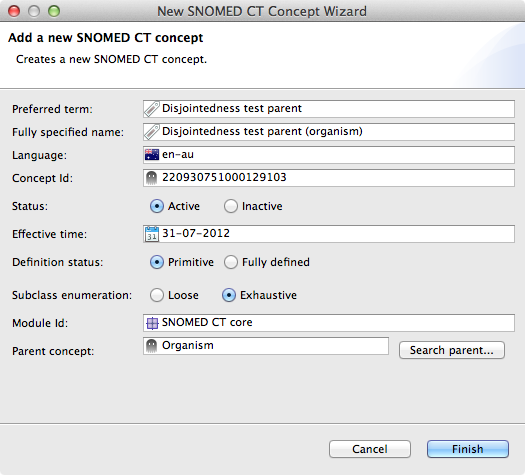 These datatypes are handled as special SNOMED CT datatypes during the reasoning, and only the default equation operator is supported. Numerical values can only be added to Pharmaceutical/biologic products that has a 'has active ingredient' relationship to a Substance. The numerical value is always tied to this relationship, each relationship can have one associated strength value. For this test you first need to create a new reference set where you specify a concept modelling rule about using numerical datatypes on the members. That allows you to add numerical values. All the Pharmaceutical products need to be added and edited in the scope of this reference set. Amoxicillin 500 mg should show up as the parent of Amoxicillin 500 mg tablet and Amoxicillin 500 mg capsule. Note: Unsupported reasoners usually drop the complete concept definition; as a result, the concept does not appear in the inferred concept hierarchy anywhere, and this would make the normal form generator believe that the concept's IS A relationships should be deactivated. This causes problems when changing to a more capable reasoner (eg. equivalent concepts appearing). To avoid this, whenever the last IS A relationship would be deactivated, the concept is deactivated instead, and the relationship is preserved. You can test this behavior with ConDOR. Universal restriction has been supported since Snow Owl v0.9. An example is included here for completeness. All children of Clinical finding will inherit this relationship, thereby expressing that there is always one but only one Clinical course relationship (all diseases have some course). Many other reasoners will work, but have a wide variety of performance and memory usage, some requiring several gigabytes of memory. Your mileage may vary. If you have something specific in mind, please send us a note at snowowl@b2international.com for advice.